Piers Morgan is outta here: Only three years after the cheeky Brit took over for a beyond-our-piddling-understanding-of-life-and-death Larry King, CNN has announced it will cancel his nightly eponymous talk show. As the New York Times reports, while Morgan will still have some unspecified role with the network, Piers Morgan Tonight will be off the air, probably by some point in March. So, how come? Now comes the next step: finding someone to take over for Morgan and finally fix CNN’s prime-time problems. Now who could that person be? That’s right! Leno’s available! And, uh, he has something of a history with CNN boss Zucker, the architect of the previous Tonight Show secession debacle. 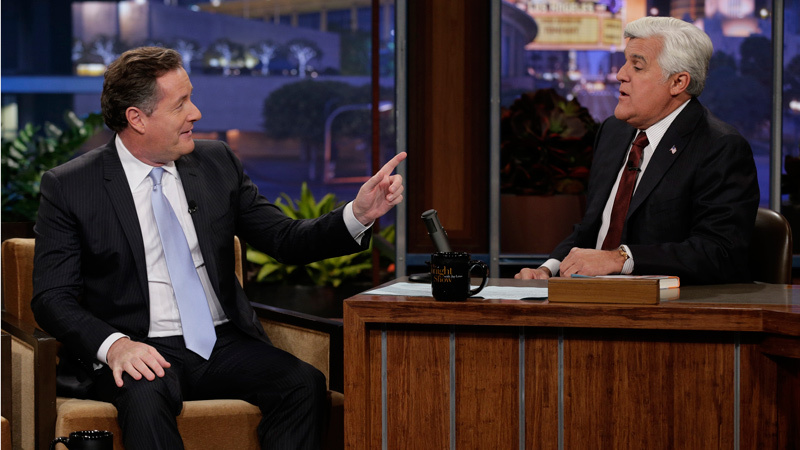 As this all-new round of mannered grumblings on his second time out the door at the Tonight Show indicate, maybe Leno’s not quite ready to give it all up. Simple enough: Someone call Rickey Minor — we’re getting the band back together! What’s that? You can’t just have Leno do The Tonight Show, but on CNN and at 9 p.m.? You were getting a little sick of “Jaywalking” anyway? You never wanna hear another hilariously misspelled headline again? OK, OK, fine: Hire Leno, but have him do Larry King. I don’t mean just have Leno lob softball questions and chuckle amiably; I mean: Have Leno put on the suspenders and truly become Larry King. This seems like a better idea than other options currently on the table, like rehiring Larry King. You know what? Forget content or approach: Right now, all we need is a fixer. If Jay can somehow channel the coldblooded, almost inhumanely predatory instincts that served him so well when he yanked The Tonight Show back from Conan, we might have an option on our hands. And you know what? I got a good feeling he can. Hold tight, CNN: We’re sending a miracle worker.